① Remove the shucks and silk and break in half. Boil for 5 minutes with an ample amount of water. ② Transfer the corn to a colander and allow them to cool enough to be handled. Use a knife to cut off the kernels, cutting along the length of each ear. ③ Add the corn, soymilk, water, shiokoji, and white pepper to a mixer. Mix for 8-10 seconds, until the kernels are reduced in size and the ingredients are mixed well. If too many kernels remain without being reduced in size, mix the contents in two smaller batches. ④ Place a colander into a slightly larger bowl. Pour the mixed contents from step ③ into the colander and strain. After most of the liquid has passed through the colander, use a rubber spatula to strain out the remaining liquid until the kernel skins form a mass about the size of a tennis ball. ⑤ Transfer the soup to bowls. Drizzle on olive oil and top with black pepper. 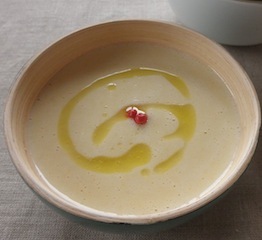 ※ The kernel skins you strained out to create a better texture for the soup have a sweet taste. Do yourself a favor and sample some.